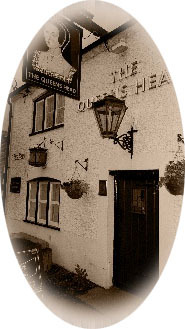 The Queen’s Head is a family friendly pub located in the centre of the village of Long Marston offering en suite bed and breakfast accommodation in a separate annexe. We are approximately three miles off the A41 and six miles off the M1 at Dunstable. We are equidistant from Leighton Buzzard, Dunstable and Tring and literally on the border of three counties: Hertfordshire, Bedfordshire and Buckinghamshire. The Queen’s Head has two en suite double bedrooms. These beautifully decorated rooms are quietly situated in a separate building just to the side of the main pub. The rooms include complimentary tea and coffee making facilities, Freeview TV’s and wi-fi access. After extensive refurbishment and decoration The Queen’s Head continues to retain that traditional pub atmosphere with the original flagstone floor, exposed wooden beams and roaring log fire. We are Cask Marque approved and stock Fuller’s Real Ales, quality wines by the bottle or glass, bottled and draught lagers and ciders and a large range of quality spirits. Our new early opening from 10 am Monday - Saturday is ideal for those who want to pop by for coffee and a cake. Plus with free wi-fi and our new lounge area you can catch up on your emails too. Traditional home cooked pub food is available seven days a week. We pride ourselves on sourcing top quality local ingredients wherever possible.